Before you think it will be too hard or time-consuming to train your cat or that cats aren’t very smart, make sure you read my story about the potty doorbell here, http://savingcatsdogsandcash.com/potty-doorbell/. Cats are smarter than they’ve been given credit for and once they learn the rules, I’ve found that they are quite capable of following them. Like all animals, they each have their own individual personalities, so training may be a bit easier or harder with some cats, but it can be done with patience. I’m always horrified when I read or hear about owners that have their cats declawed or are contemplating doing it because they don’t want their cats to harm their furniture or curtains, or whatever. I always wonder if they really researched and tried all other possible avenues before taking or turning to such drastic measures. Cats are very similar to dogs in that they don’t want to intentionally upset you, but they also don’t come automatically knowing the rules of what is acceptable behavior and what is not. As their owners, it is up to us to teach them acceptable behavior. Pet ownership isn’t about taking shortcuts, it’s about putting in the time and effort to mold your cat (or dog) into a loving and obedient companion. I can tell you that the satisfaction and bond you’ll have with your well-behaved pet is worth the effort. Though he was an otherwise sweet cat, KK had a couple of unacceptable bad habits. One was scratching on the wooden door trim when he wasn’t immediately let outside when he meowed at the door to go out. He also thought that attacking feet was ok. Unfortunately, the times he chose his attacks were at the worst times possible, such as when we were standing at the stove cooking or while we were sleeping. Only having had dogs my adult life (because no cats had ever shown up prior to KK), KK was sort of my guinea pig with cat training. From working with dogs, I knew the best way to discourage unacceptable behavior was by using the word “No”. Unfortunately, it quickly became apparent that teaching a cat the word “No” and teaching a dog the word “No” required different tactics. Just wanting the door trim and foot damage to stop, I got online to see what popular cat training methods were out there. Since I already had a water bottle I used for spritzing clothes for ironing and de-wrinkling, I decided to use the water squirt bottle method. The use of a stream of water would obviously get more attention when used in conjunction with the “No” command, that was currently sometimes obeyed, but sometimes not. I was also looking for something that would be a permanent deterrent, instead of just a temporary one. I turned the spray nozzle to stream and waited for a training opportunity. Luckily, KK and all the other cats that came after him were quickly and easily trained by the word “No” being firmly said and a squirt or two of water from the spray bottle if the verbal command wasn’t obeyed. Interestingly, I found that the cats were more prone to obey with just the verbal command if they were close. If they were beyond arms reach where you couldn’t easily get ahold of them, they seemed to be more stubborn about stopping whatever bad thing they were doing. After those initial few times of being sprayed by water, just telling the cats “No” firmly is now sufficient to get them to stop doing whatever they are doing. On the few occasions that “No” doesn’t work, or the word “No” and a hand clap, generally all I have to do is show them the water bottle and they stop. I only have one or two cats that require that third step with the water nowadays and that is only very occasionally and almost always in the bedroom, when our sleep and safety are being compromised by someone’s bad behavior. When it came to training the cats not to scratch on the furniture, I found that to be quite easy as well. By showing them and interacting with them often on the scratchers, I was showing them where the appropriate place was for them to do their scratching. On the rare occasion when I caught a cat scratching on the furniture, I’d promptly move them to the nearest cat scratcher, where they would normally finish up their session. 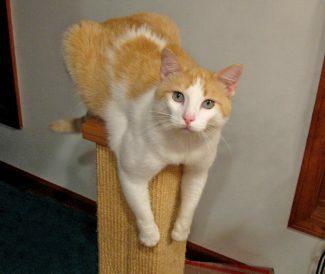 For help training your cat to use the cat scratcher, most of them come with catnip to entice a cat to use them. You can also use a toy like a feather or a shoestring to play with the cat on the scratcher. I’ve found that once the cat sinks their nails into the cardboard or fabric or whatever the scratcher is made of, they realize its purpose and will then return to it pretty easily. I’ve also just been on the floor petting or playing with the cats and used my finger to scratch the surface to make a little sound on the cat scratcher that quickly appeals to a cat’s hunter instinct. Even if they’ve walked away, the cat will come back and use the scratcher upon hearing that scratching sound. That continued reinforcement teaches and reminds the cats of the designated places for their scratching. The first scratchers I bought were these inexpensive flat ones, http://amzn.to/2x910cT which have a removable and reversible scratch area, so you can use both sides of the cardboard. I also bought this wedge one with the little fluff ball inside, http://amzn.to/2y4jgC1 that some of the cats enjoy to this day. It also has a reversible cardboard scratching area. Both appeal to cats that like flat or slanted scratching surfaces. The cardboard scratchers worked fine in the beginning when I just had 2-3 cats. Even now, my two youngest and smallest cats still really enjoy using them. Unfortunately, the cardboard scratchers are kind of small, and with much use, tend to make a mess on the floor from small pieces of cardboard that get pulled out. If you pay attention to when a cat scratches on things, they tend to stretch their bodies as they do it. It made sense that they’d appreciate a vertical scratcher that simulated the stretching they got from scratching on the arm of the couch or loveseat. After doing my research for a cat scratcher nobody would outgrow, looked decent sitting in my dining room and would last, I found this scratcher, http://amzn.to/2x8Utiu. After six cats using it regularly, I have been extremely pleased with its sturdiness, how nice it looks, how it doesn’t shed and how well it’s held up. Here’s Moose playing on our scratcher. I’m using a stick that has a few remaining feathers on the end, and also a shoestring to entice Moose to use the scratcher. You can see after three years of daily use by multiple cats, all with untrimmed and full sets of nails, that the scratcher still looks almost new. Once I added this scratcher to the mix, I hardly ever have to remind one of the cats not to scratch the furniture.